This green tea has a unique shape of a pearl and comes from the Chinese province of Fujian. These pearls consist of two types of leaves and hand rolled buds. This tea has a sweet flavor with a flowery jasmine aroma. Researchers in Japan found that people who drink green regularly have a lower chance of getting cancer or developing heart diseases. 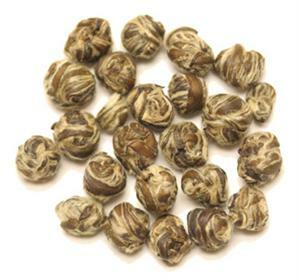 Dragon Pearl is a great tasting healthy tea to drink regularly. We highly recommend it.